Digitalization has to be lead in organizations – but how? On 30th September I had the chance to participate an event organized by PRY (Projektiyhdistys ), which is the local Finnish association belonging to IPMA (International Project Management Association). IPMA is known for its project management certification system. The purpose of this theme event of digitalization was to get introduced to methods and lessons that can be of help in advancing digitalization development in organizations in Finland and thus lead us as an economy back to the growth trend. I think this as a current issue in design thinking as service designers participate in design projects involving digital concepts and their skills are also needed in transforming an organization’s mental mode towards design thinking (DT), due to the growing pressure to digitalize processes or entire business models that requires DT approach. Why is everybody now talking about digitalization? Vesa Ilmarinen, the founder of Katalysti company, probed us first on our perceptions of digitalization. He defined it as an operative change that needs leadership. Currently, digitalization is a hype term in the media and it arouses both concerns and hopes. Concerns in that it destroys many jobs and hope in that it creates new kinds of businesses and job opportunities. One could imagine service design to be one of those new opportunities. Vesa mentioned trends leading to digitalization being rapid technological development that affects consumer behavior patterns, shift of power from service and product providers to consumers and thus the increased demand for rapid responses, honesty and transparency from organizations. but introducing new kind of leadership and ways of working to the organization. operative model of the company and the company culture. How to proceed with this change? 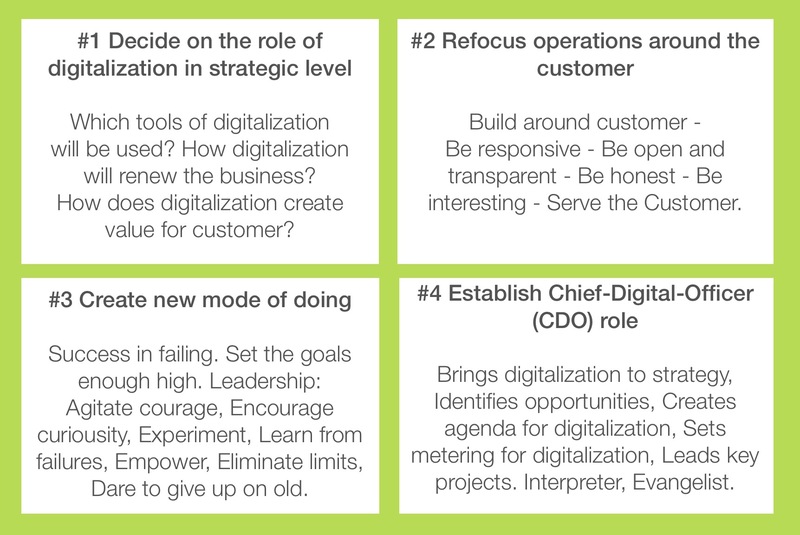 Vesa introduced four lessons on how an organization can take leadership in the digitalization development. They are grouped on the following image with related activities specified further. During the remaining part of the event, project manager Pirjo Saksi from Ministry of the Environment shared her experiences on stakeholder management as a tool for leading change. Her project is the first joint development project in the public administration (national register for housing company shares of stock) involving diverse public actors. Thus stakeholder analysis is of great importance to engage everyone and to enable decision making. 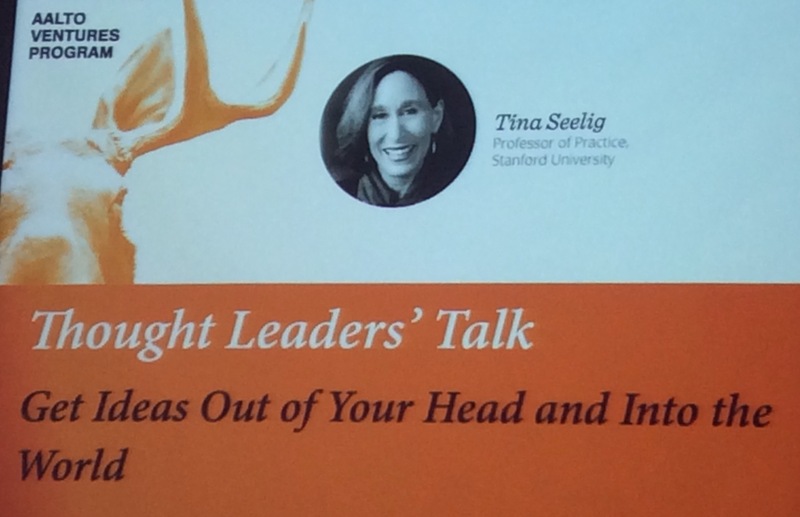 In the very first day of SID program, I spent evening after the course getting inspired by Tina Seelig, a Stanford University Professor and co-director for the Stanford Technology Ventures Program. The forum was Aalto Design Factory’s series of Thought Leaders’ Talks. Tina has been recognized as a national leader in engineering education and she teaches courses on creativity, innovation and entrepreneurship in the Hasso Plattner Institute of Design. Yep, you remember correctly, the same institute from which Katja Tschimmel introduced us one of the pioneering innovation models. Tina spoke about how to get rough ideas out of our heads into the real world and further into ventures. She introduced us the tool she has developed, the Invention Cycle. We started off with the concept of Creativity. What is creativity essentially? We have to agree on the basic concepts and to create a common vocabulary first to make communication easier. Creativity is a skill we can learn, by practicing. In a nutshell, innovating starts with Imagination – envisioning things that do not exist yet. Creativity is needed in using our imagination to face challenges and in innovating unique solutions to them. We also need Entrepreneurship to apply innovations. All of these elements (Creativity, Imagination, Innovation, Entrepreneurship) make an Invention cycle, characterized by relationships, attitudes and actions. Going further into the imagination phase, Tina pointed out how true passion is evoked with engagement. We need to be motivated and to motivate others and have the right mindset allowing experimentation, which generates us the data we need to carry ideas further. Regarding experimentation, Tina introduced the thought of doing pretotype before prototype. The example given that enlights it well was offering a new dish in the restaurant menu just to see if it would be ordered or not. This way we can rapidly see if the concept is worth developing further or not. We should put a lot of time and attention to looking our ideas from different angles – we should ask the right question before ideation phase. There exists an infinite number of solutions. To maintain the right set of mind, Tina suggested that in the beginning of innovating we ought to fall in love with the problem, not the solution. When achieving the implementation phase of the Innovation Cycle, we need entrepreneurial spirit: capability to inspire others to invest on our idea and to build a good team. We also need grit or sisu to push through the greyest stone. Tina referred to storytelling as an aid to create a compelling sales pitch. In the conclusion of the lecture audience posed a few questions to Tina. One of them was how to implement the cycle. According to Tina, we should first figure out where we are in the cycle. We need people with diverse sets of strengths – creatives, innovatives, entrepreneurs and so forth. Then we should share the essential vocabulary, inspire our team and excite our imagination with problems! The other question which alerted my curiousity was about whether this concept or tool is transferable interculturally. I disagree on its transferability, as the degree of power of authority in societies varies a lot. You need a culture with low degree to enable the equality of team members and thus enable them to contribute to the process. I would gladly receive comments on this thought on the blog comment section. Tina has published a book that goes deeper into these lecture topics. It is called “Insight Out” and is available in Amazon, currently being rated 4,5 stars by 23 readers. In Helsinki Design Week 2015 I attended City Design Meet-Up on 7th September, an open event arranged by Design Driven City (carrying the legacy of the design capital year 2012) and Forum Virium Helsinki. What is the so called new design? What common elements are there in traditional industrial design (such as Kaj Franck’s drinking glasses) and in the new design or service design? The host of the event pointed out that design has removed itself from the center of attention: the spotlight is now on the users/customers. In the opening speech the Helsinki city vice mayor Ms Sinnemäki stated the goal of designing the city as creating a space based on openness – a city that belongs to its citizens. The role of service design is to bring together the perspectives of diverse stakeholders and to integrate their planning practices. In city design, the way city inhabitants experience daily life service processes is the focus of attention. City design aims at creating more wellbeing with shrinking resources. City design also contributes from its part in increasing the international interest towards Helsinki as a city that nurtures its Finnish traditions of good design. The main body of the event consisted of three city designers (engaged in the city of Helsinki projects) representing their insights of using service design in city design. I will introduce here the thoughts of one of them, Mr. Kutvonen. He summarized his insights from three different angles: 1) the journey (Matka) 2) the design (Muotoilu) and 3) the turning point (Murros). According to Mr. Kutvonen’s experiences, influential persons with a vested interest in the change are needed to accompany the journey. Designers should also always strive to have something concrete to show, for example by using storytelling. Acknowledging unpleasant facts as they emerge during the journey was seen by him as an important skill that service design education does not prepare for. As part of the journey, a radical experimentation questioning the existing patterns of operation in the community should be carried out. 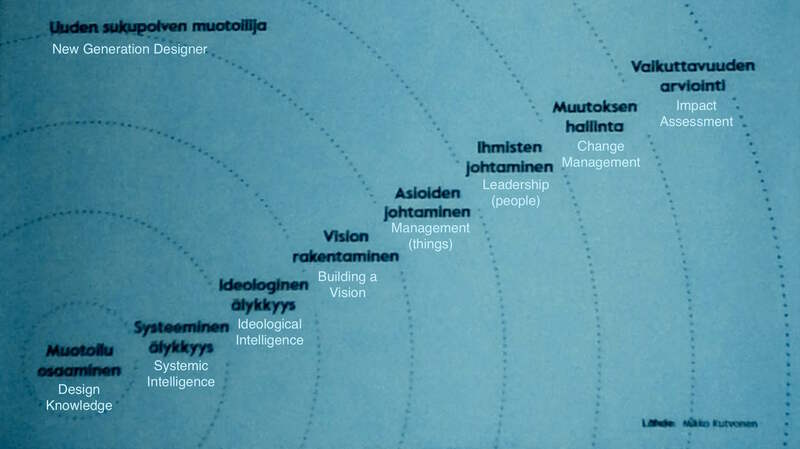 Kutvonen experienced that implementing service design is a lesson in leadership in practice. He pointed out that organizations are today faced with being offered separately packaged development solutions of service design, lean development or agile approach – all having similar ideological background. This must be a bit confusing, I wondered. Regarding the emerging need that an organization has for a turning point, service design can serve as the tool for attitude change – by putting the customer needs forth, openly engaging stakeholders to participate and by implementing development through experimenting. City designers reminded the audience also on how crucial it is not to forget joy and playfulness when encouraging innovation. The remaining part of the event introduced experiences on implementations of urban service design via case studies. One of them was the smart city project of Kalasatama. The project representative emphasized the importance of human centeredness, being one of service designer’s main responsibilities. According to her, the main benefits of using Kalasatama urban area as a ”laboratory” for service experiments is the instant feedback gained not only from user experience point of view but also the experiences obtained from actually producing the services tested.